Some of the 200 people taking part in Wednesday's mock oil spill on the Indian River. It may have been a drill, but those running the exercise insist the point was real enough. EPA on scene coordinator Ralph Dollhopf says the 2010 Kalamazoo River oil spill showed the need for responders to know each other before a disaster. Ralph Dollhopf is with the Environmental Protection Agency. He coordinated the federal response to the 2010 Kalamazoo River oil spill. Dollhopf says important lessons were learned in 2010 that are part of this week’s drill. “Technically, we’ve learned a whole lot. We have more to learn. There are information gaps. But we’ve made great progress,” says Dollhopf. Dollhopf says just getting to know the other people around the table at the Command Center is important. Numerous federal, state and local government agencies, as well as officials from different companies work together in the command center. The groups involved in this week’s drill are the same ones that will have to respond to oil spills throughout the Great Lakes. Their response times to the scenes of future events may vary, but officials at today’s mock spill insist crews can begin the work within hours of a spill being discovered. Federal, state and pipeline officials are working on plans to conduct a mock oil spill in the Mackinac Straits. 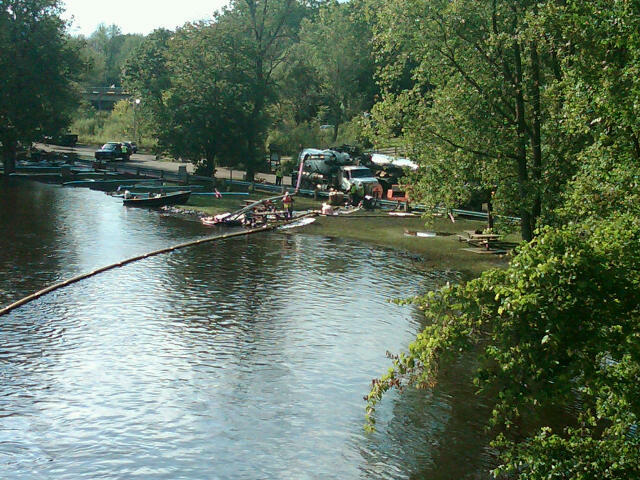 The four year old cleanup of the 2010 Kalamazoo River oil spill is winding down. While practice for future oil spills went on in northern Michigan, in southern Michigan the cleanup of an old spill is finally winding down. After four years, Enbridge has completed its work in the Kalamazoo River. Enbridge spokesman Jason Manshum says crews completed EPA ordered dredging in Morrow Lake Delta last week and the EPA has signed off on that work. Manshum says it will be a few more months before Enbridge’s total Kalamazoo River cleanup is complete. The company is doing some work restoring shoreline near the site of the former Ceresco Dam. Manshum says it will also take time to remove oil soaked river sediment dredged from the river from a pad in Kalamazoo County. Once the sediment is removed, Enbridge will need to restore the property and turn it back to its owner. The EPA originally wanted Enbridge to complete its cleanup by last December. An EPA spokesman declined Wednesday to comment on possible penalties Enbridge may face for missing that deadline.